Are you at a loss for what to do with those old VHS or HI8 tapes? Don't let your fond memories deteriorate with time! Put those videos on your own custom DVD. 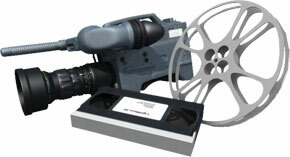 Our Ultimate video package utilizes any VHS, compact-VHS or Hi8 (8mm) tape and digitizes it through Cannon's DIGIC DV system. We edit up to 60 minutes of raw footage to remove any scenes that you wish to omit. The edited footage is then encoded for a DVD using Apple's professional Compressor application. Also included are chapters, a custom menu and a scene selection for your viewing convenience.